The Los Angeles Lakers lost LeBron James’ home debut 124-115 to the Houston Rockets. 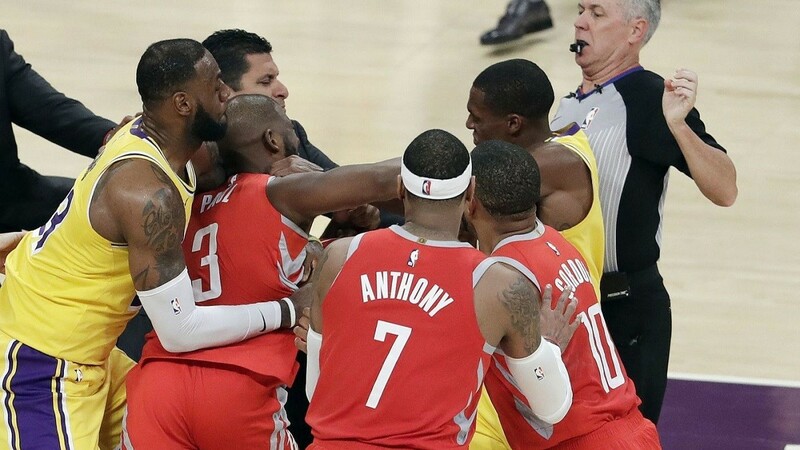 The game was interrupted by a fight with 4:13 remaining in the 4th quarter, with punches exchanged between the Rockets� Chris Paul and Rondo Rajon of the Lakers. The high-scoring and energetic game devolved into an intense physical matchup, which had the intensity of a heated playoff contest. Events initially took a turn with 9:47 to go in the 4th quarter when the Rockets’ Jason Enniss clotheslined Josh Hart while driving to the basket. The refs only called a flagrant 1 foul, although the consensus was that it was more severe and should have been called a flagrant 2. With 4:13 remaining, Brandon Ingram fouled James Harden on a breakaway. After the play, Ingram shoved Harden. A scrum ensued. The usually-cool Ingram and Harden exchanged of words. Lance Stephenson attempted to defuse the situation and pushed Ingram away to the opposite end of the court. Simultaneously, Rajon Rondo and Chris Paul were involved in fisticuffs. The long-time adversaries spilled their share of blood over the years. The latest incident was another chapter in a long-running novel between two tenacious NBA veterans that do not like one another. Rajon allegedly spit on Paul, which provoked Paul to respond with an eye poke. Rondo instantly countered with a haymaker and Paul landed a punch of his own. As quickly as fists were flying, Brandon Ingram sprinted down court and rushed into the scrum. Ingram landed a glancing blow on Paul. LeBron James pulled Paul out of the fray. “That quickly erupted into something ugly, ” added commentator Mike Breen, broadcasting the game for TNT. During a ten-minute delay, officials reviewed the incident and doled out infractions. Rondo, Paul, and Ingram were ejected for fighting. Ingram was asses two technical fouls � one for shoving Harden and the other for throwing a flying-punch. Paul and Rondo received technical fouls for fighting. Video replays did not show Rajon spitting on Paul. The Lakers vehemently denied the incident. “I didn’t see that. I saw Chris Paul touch his face then go from there,” said Lonzo Ball. NBA Executive VP of Operations Kiki VanDeWedge attended the game and witnessed the fight. The NBA will take swift action because the Rockets are in Los Angeles for a back-to-back games with a Sunday night contest slated against the L.A. Clippers. Rondo, Ingram, and Paul are all expected to face hefty fines and suspensions. Lonzo Ball, who saw limited action recovering from knee surgery, will fill in for Rondo at point guard. “I’m 100. I’m ready to go,” Ball told reporters. A star-studded crowd attended opening night for the Lakers at Staples Center in downtown Los Angeles. Actor Jack Nicholson and music executive Lou Adler were in their assigned seats next to the Lakers bench. The top figures in the entertainment industry were not going to miss LeBron’s debut including super-agents Irving Azoff and Michael Ovitz. Among the other celebrities spotted sitting courtside included Leonardo DiCaprio, Adam Levine, Kendall Jenner, Jonah Hill, Wiz Khalifa, Floyd Mayweather, and Kate Beckinsale. The young Lakers were expected to struggle, but they are off to an 0-2 start with LeBron James. The Lakers had a chance on opening night until the Blazers pulled away late in the fourth quarter to win 128-119. The Lakers were holding their own against the Rockets. The score was 109-108 when the melee erupted. After the interruption, the Rockets outscored the Lakers 15-7 over the last 4:13 of the game. 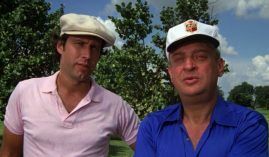 “We were right there. It was a one-point game and we had opportunities to win the game,” James said to reporters. James finished the night with 24 points. James scored 26 points in his debut against Portland. The Lakers struggled from three-point range for a second game in a row. Lonzo Ball hit four treys on 4 of 8 shooting, although the rest of the team struggled shooting 25% on 8 of 32 from behind the arc. In their first loss against the Blazers, the Lakers shot 7 of 30 or only 23% as a team.